This was another action packed episode! Rose met cute with a handsome banker named Atticus Aldridge, as she carried baked goods in the rain. He is from a Russian family of Jewish heritage, and faced an unkind reception from some of the Russian refugees. Simon Bricker slinked into Cora's bedroom only to be confronted with Robert, where they had a full-fledged fight rolling on the floor and making quite a racket. 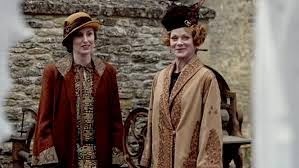 Edith brought Rosamund to meet Marigold, and later Rosamund and the Dowager Countess told Edith that they decided to send Marigold to school in France. It sounds like Edith has other plans, though. Charles and Mary planned to foist Gillingham back off to Mabel Lane Fox. Thomas is not well. Anna was questioned by Scotland Yard about Green's death. Most important of all - Sarah Bunting finally left the village! Cora finally got a central storyline when she was pursued by art historian/would-be lothario Simon Bricker. Robert was jealous and mad. Cora tried to make nice with Robert, but he was having none of it. I like Cora, and she generally is treated as a secondary character at Downton, so I will give her character of the week. Rose's charming meeting with Atticus, walking in the rain with umbrellas, was my favorite visual this week. Robert rolled around on the floor fighting with Simon Bricker. I don't want to be too greedy with wishes, since I finally got my great wish -- Sarah Bunting has departed. That said, I hope that Robert will be nicer to Cora. I hope that we will see some resolution with Mary and Tony. I hope that the endless Anna/Bates in trouble storyline will end. I hope that Edith will finally find a way to parent her daughter. What did you think of this week's show? What would you like to see happen next? I'd love to hear from you in the comments, below. Hi Trish, what a great recap this is of Downton Abbey. My kids and I are huge fans and we feel the same as you do in your observations. I'm glad Miss Bunting left too. And I'm glad Cora is more in the limelight as well. I feel so much for Edith. She always seems to get the bad end of the stick. Poor girl! Laura, thanks for your comment! I agree completely about Edith. I just hope she finds some happiness (and hopefully sooner than later!). This season is one of my favorites yet!!! Neely, I like this season, too! It seems like the pace has picked up a bit, and I also am enjoying the various storylines that are occurring at the same time.